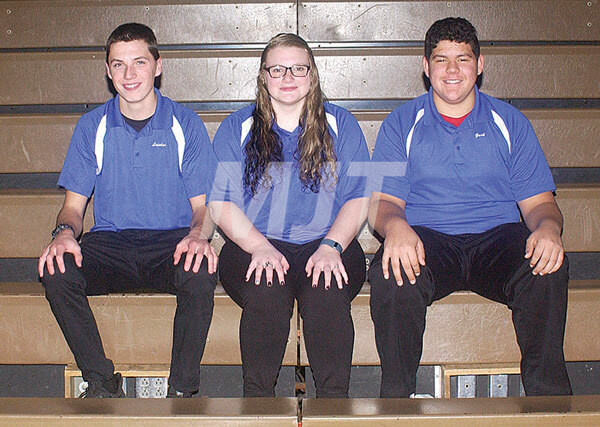 Returning lettermen for the Monarch boys bowling team are from left, Landon Winfield, Kayla Helton and Zach Tompkins. Each helped MHS beat Pickerington Central on Tuesday. Marysville High School senior Landon Winfield finished with a 492 series as the Monarch boys bowlers defeated Pickerington Central, 2364-2078, on Tuesday. Winfield rolled a 279 game en route to his series score on Senior Night. Zack Tompkins, a junior, had a high game of 300 and a 491 series. Senior Kayla Helton bowled a 357 series. Marysville’s girls dropped a 1497-1400 verdict on Senior Night to Pickerington Central. Seniors Miaella Cudnohoske and Alexis Stiltner bowled in their last home match. Cudnohoske finished with the best two-game series for Marysville with a 260. Emily Myers bowled the high game for Marysville of 138.